One New Aftermarket Replacement John Deere Power Steering kit that fits John Deere Tractor models. 1020, 1120, 1130, 1520 (3 cylinder tractors). Kit Contents: mounting flange, power steering cylinder, hydraulic pump, oil tank, pressure tube, inlet hose, 2 tie rod ends, pump connection, v-belt, pulley, hardware. Tractors with horizontal exhaust may need to be modified or changed to vertical exhaust. Kit contains parts to convert manual steering to power steering, including belt driven pump and reservoir. Not recommended for applications with front end loaders. Our processing system is automated. Thank you for your continued patronage. We carry parts for Engines, Transmissions, Front & Rear Axles, Hitch & Drawbars, Undercarriages, Final Drives, Seats, Bearings, Cups, Cones, Seals, Discs, Couplers, Gears, Brakes, Pressure Plates, Pilot & Throw Out Bearings, Ring & Pinions, Gaskets, Decals and MORE for most high wear items. We also carry replacement parts for the Boom Cylinder (Seal Kits, Tubes, Glands, Pistons, Rods). 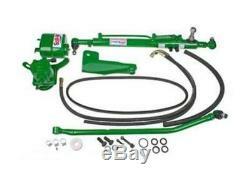 The item "Power Steering Kit Made To Fit John Deere 1020 1120 1130 1520" is in sale since Thursday, June 23, 2011. This item is in the category "Business & Industrial\Heavy Equipment Parts & Accs\Antique & Vintage Equip Parts".